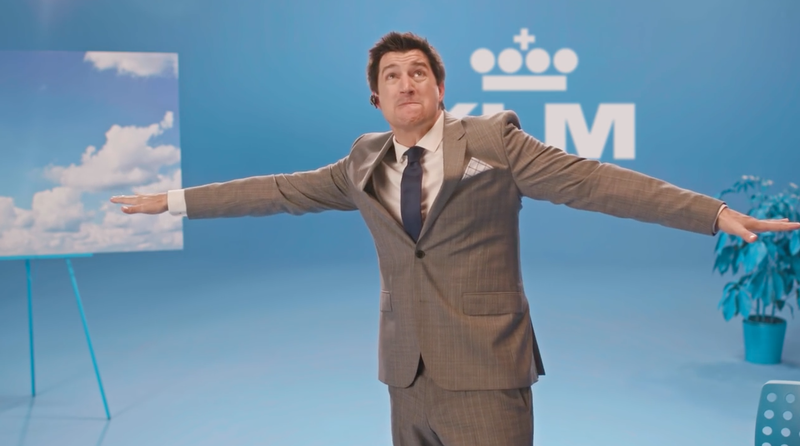 Actor Ken Marino goes to great lengths to make that simple point for the Dutch carrier in a series of self-consciously silly (and sometimes sweaty and shouty) online videos. Well, that was exhausting. Time to lower the oxygen masks! The oddball approach stems from a survey that found many U.S. consumers were unfamiliar with KLM, with some mistaking the carrier "for a radio station or a brand of milk," Mustache CEO John Limotte tells AdFreak. "We hit on a boldly unambitious idea that got us really excited: What if we just say it's an airline?" Limotte says. "We talked about reading dictionary definitions of airline terminology. And from there, it evolved into the idea of a spokesperson sharing information about an airline that really doesn't require sharing." In the next spot, Marino waxes romantic about a gal he met on a recent flight. Seems this certain special someone strolled around the cabin for most of the trip, asked Marino if he wanted to grab a drink, and when he explained he's dealing with "a lot of baggage," it "didn't seem to faze her one bit." "We wanted to find someone who could play really stupid in a very smart way, and appeal to the sort of sophisticated audience that would enjoy flying via Amsterdam to the world," says Limotte. "Ken was actually our first choice—people always say that, but in this case it's true—and luckily for us, he was not only interested but he really liked the semi-ridiculous concept." Marino really earns his wings by wringing every last comic nuance from the scripts, and he works extremely hard to sell the campaign concept. "During the hero video ['It's an Airline'], Ken got really excited about the miniature Deflt house [that every KLM World Business Class passenger receives as a gift], and that excitement turned into him running around the set like a madman, screaming, 'A TINY COLLECTIBLE HOUSE!' " Limotte recalls. "After 10 takes of him sprinting around the room, we had to pause to wipe up all the sweat. Ken was pretty dry, but the follow-focus guy was drenched." Alas, despite the effort, these spots don't always soar. For one thing, each feels a tad too long. You could probably fly from Amsterdam to Inverness in the time it takes for the "Airport" video to come in for a landing. Marino's shtick can get grating, too, even turbulent at times, and that might send some viewers in search of parachutes or inflatable slides to escape his flighty patter. "[The character] has no idea how he comes off—oblivious, long-winded, redundant," says Limotte. "He's just a dude who absolutely loves flying." Fair enough. But would you want this guy sitting next to you on a plane?